Wat : The combination up there surely gives me the retro feel. This combination somehow reminds me of the 80s' , maybe its the patterned print top and this yellow skourt that just gives me that 80's fashion feel. Wat : Our country's hot and humid weather surely needs us to wear more of these lacey and comfortable tops. Above here is a lacey vest that is flexible and comfy. Wat : Put on those headphones of yours and blast the music away ! 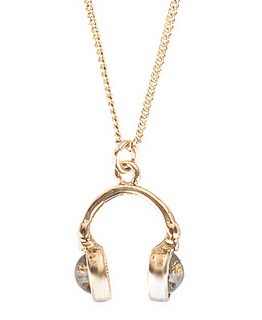 This necklace here is a miniature version of the headphone. Put it against a black outfit, and it will surely grab attention ! Wat : The first thing that caught my eye when i saw this picture was the dress the girl was wearing..But on a second glance, i began noticing the cute pink handbag that she was carrying. Wanna complete your pink princess look ? Get that bag !